In his opinion, the best clues are the ones where at least one player gets it right AND at least one player gets it wrong. In other words, not too hard, not too easy… juuuuuuust right. This happens to be my criterion, too – and I’ve heard it’s also the goal of the Jeopardy! writing staff. Pat has been keeping track of each game and providing a moving count over the past 10 games, with a “sweet spot” of between 40% and 70% of “good” clues. Looking at 10 games at a time levels out some of the variance. For me, the higher percentage, the better, but in any event, I thought it would be fun to go through the data to see whether the running totals have changed over time. Looking at the regular games starting with December 1, 2004 – the day after Ken Jennings lost – we get a chart that looks like this. I disregarded the one single-player Final Jeopardy! 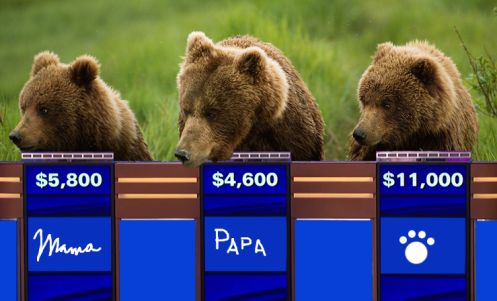 and any two-player Final Jeopardy! in which both players got the same result, as it’s impossible to know what the other player(s) would have done. On seven occasions we’ve had a perfect 10, all during big runs: July 14-15, 2005 (David Madden); September 25 and 28-29, 2009 (Andy Srinivasan); and January 1-2, 2014 (Jerry Slowik). Twice we had a zero: January 17-18, 2011. Looking at the chart, it looks like Season 27 was an outlier, and the numbers bear this out. Seasons 24 and 26 (and the abbreviated part of Season 21) were the best. So far this season, we’re almost dead on for the long-term average: around 60%. Perhaps there was a staff change during those seasons. I’m sure someone has that information readily available; if not, I can look into it at some point. Here is the breakdown by combination of correct answers/players. This suggests that if two players have the same outcome, there is around a 75% chance that the third player will, too. Thanks to Ben Wiles for catching my error – December 1, 2004 instead of November 1. Thanks for taking my pitch and hitting it out of the park. If you are looking for more work, how about this: How often does Final Jeopardy change the outcome of the game? For instance, yesterday (1/5/15) Dara was ahead going into FJ but Elliot pulled out the win. You might have even calculated this before. And, if you are a true glutton for pain, how often would someone else have won if only they had taken your advice and wagered correctly in FJ? It has happened often enough to inspire you to start this blog. But it would be nice to know the actual number. Why not 100% – I picked a 40% – 70% range because there is supposed to be some randomness involved. Players have a good day or a bad. The like or don’t like the category. The particular “answer” might just happen to be something they all know, even though they shouldn’t or don’t know, even though they should. So there should be some random variation, some noise. This should mean that neither the “easy” nor the “hard” buckets should be completely empty. If either or both are consistently empty then there’s something wrong. A few runs like the ones you found are normal. But a long run of 100% (or 0%) means the game is fixed. Fortunately, the numbers I was seeing and the far larger set of numbers you analyzed show just the kind of randomness that should be there.